We all know we travel or live abroad to expose ourselves to new foods, cultures, people and ways of life. I wouldn’t generally say I travel to expose myself to new insect experiences. But sometimes those experiences can’t be avoided and it’s all I can do to turn them into a positive educational experience for my kids, just as I would any other surprise event in a new environment. During this morning’s experience I had to consciously focus on putting a positive spin on our up-close experience with what has to be one of North America’s most disgusting insects – a cicada. 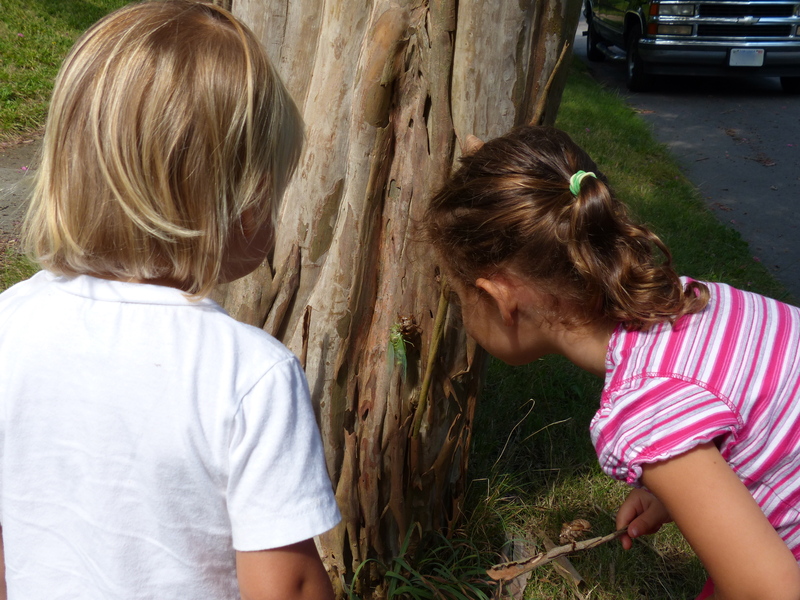 Cicadas were foreign to my kids before we moved to Virginia. Now they look for them on the trees every time we leave the house and climb into the car. Rather, they look for the leftover skeleton clinging to strips of bark on the crepe myrtles, the barbs on each leg firmly embedded into the skin of the tree. They pick them up and examine them. . . every day. Today was a little different. Little P (three-years-old) picked up the little skeleton endearingly and set it on her finger. The skeleton didn’t let go. She tried to flick it off, but the soft barbs stuck to her digit. She screamed. She starting vigorously shaking her hand. It stuck. Tears flowed from her eyes as she shrieked with fear. She thought the bug skin was intentionally holding her in its icky grasp. In a moment the ordeal was over as the shell flew across the sidewalk. Little Peanut (two-years-old) ran over and squashed it with her shoe. That settles that! If I had simply comforted Little P and retreated to the house, I think she would have developed an unhealthy fear of cicadas. They are, in spite of their ickiness, totally harmless. While I comforted her, I explained the facts of the cicada (si-kay-da) life cycle. It was dead, sweety. It wasn’t holding on to you on purpose. She was reasonable and suggested we look for another one, since the one that attacked her had been dispatched to bug skeleton heaven. Oh, were we ever in luck! 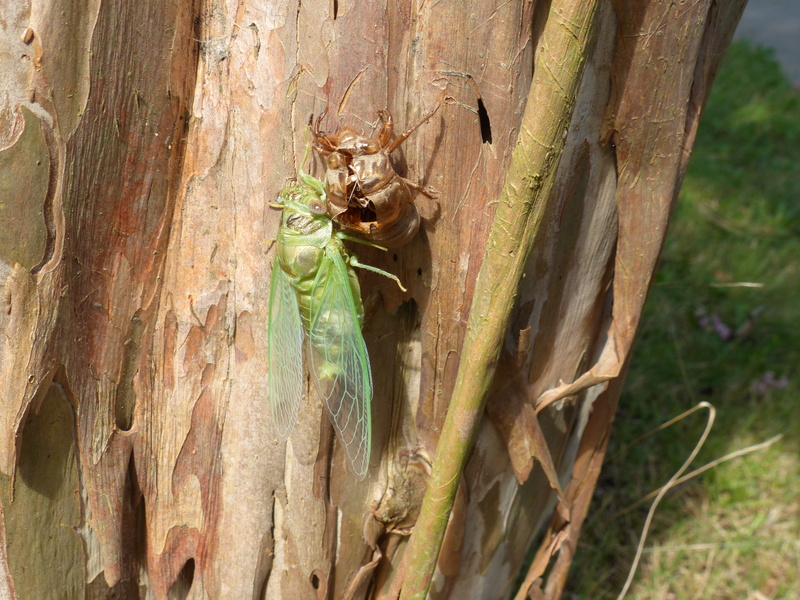 To my horror, on the next tree, at kid eye level, I spied a large, green fresh cicada emerging from his shell. Oh, how neat! I was disgusted by its appearance, but this was such a teachable moment. We peered in close at its bulging eyes and delicate wings. Insects are a fascinating aspect of creation, but still totally gross. A praying mantis has bulging eyes, but they’re kind of cute in a “that-bug-prays” kind of way. And butterflies have delicate wings, but they are colorful and attractive to the human eye. They are butterflies. Cicadas are just nasty. Several inches long, they are something you might expect to find in the Amazon, not mild Virginia. Cicada bodies must have been used as models for alien beings in movies where the aliens invade earth and dissect humans. If they were a pest in the home and needed to be killed, they are too big to squash with your foot. They would crunch and you might actually be able to hear them make some sort of screaming noise. It would be traumatic. With these thoughts passing through my mind, I smiled and nodded at the girls as they watched the creature in awe. They poked at it and I cringed, imagining it flying into one of their faces and all of us screaming – again, for a harmless creature. He must have just emerged because our poking abuse didn’t cause him to stir much. Making up some excuse about it getting hot in the sun, I told the girls it was time to go in. But the educational experience would continue! Can’t pass up an opportunity like that. I found a youtube clip with a time lapse of a cicada emerging from the skeleton. It even had music accompaniment. The girls were fascinated. I also found some coloring pages of cicadas online, which I printed and they promptly covered in vibrant butterfly-like hues. And I redeemed the original trauma of the skeleton on Little P’s finger. Cicadas were not to be feared. Cicadas were cool. I remember, as a child growing up in Kansas, collecting cicada skeletons. I was proud to show off a big plastic bag full. Just as cool as hunting for Easter eggs – almost. I’ll take jelly beans any day. We have them here in Japan. I love the noise they make in the summertime actually, but yes the bugs themselves are pretty gross. I am going to miss that though – riding my bike a long the river listening to the buzz of the cicadas 🙂 it’s so comforting! They are definitely loud, but it’s a comforting white noise. It reminds me I’m living in America (or in your case, it might remind you of Japan after you’ve moved back to the States). It’s a similar comforting feeling to hearing the whoop-whoop of frogs in Africa at night. Loud, but pleasant. I miss it when I’m not there. I took a summer entomology class at the San Diego Natural History Museum in high school. It gave me an apparently usual appreciation for insects and arachnids. Sure, I jump when they surprise me and I’ve squished my quota, especially mosquitos. But I usually watch them curiously and try to usher them outside to continue their special jobs in our world. Pretty amazing creatures. Glad your kids are being introduced.